Echoflex Solutions decorator style switches are self-powered and communicate wirelessly to linked devices. 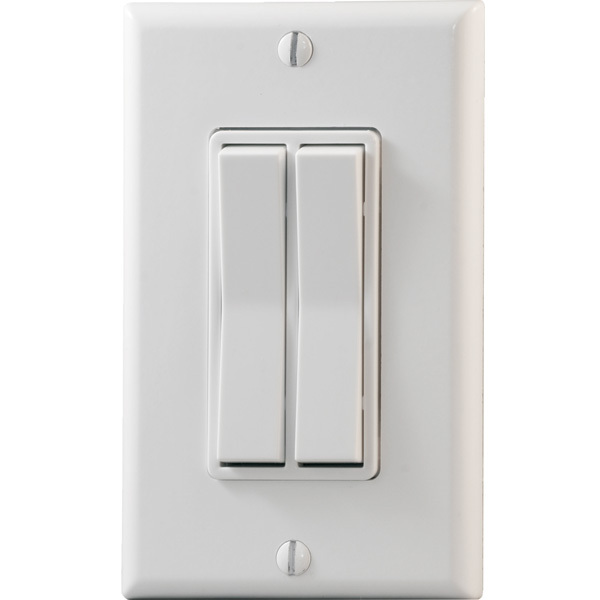 On/off control or output dimming levels are transmitted using the energy of a finger press upon the ON or OFF side of the switch paddle. Batteries are not required, meaning there is no maintenance needs for these switches. Dual paddle models operate identically to the single paddle switches. Each paddle can be linked to different controllers for multiple circuit control from one wall station. Transmission range for interior spaces is commonly better than 24m (80 ft.) – up to 100 m (330 ft.) line of sight. Two parent models are now available: The PTM365 comes with a UL/CSA certified barrier plate for mounting in junction boxes containing line voltage wiring. The PTM365 models are available at 902 MHz, in white or gray and come with matching cover plate. If flush surface mounting is required, a separate surface mount back plate kit is available to order. The PTM265 comes only with surface mount back plate option and is available at 902MHz or 868 MHz in black, ivory or light almond. The cover plates are not included, all colors match Leviton’s correlating cover plate colors.